Donald Glover (also known as Childish Gambino) in scene from "Guava Island." The film Guava Island debuted at the Coachella Valley Music and Arts Festival on April 11, followed by a rollout across the content streaming platform Amazon Prime. Starring actor, writer, and musician Donald Glover (also known as Childish Gambino), and singing superstar Rihanna, the musical drama uses vibrant scenery and art to tell an anti-capitalist fable that condemns systemic greed, while celebrating the resilience and creativity of working people. It’s a film that is bound to draw viewers in with its energy and bold messaging, while not overstaying its welcome at a taut 55 minutes long. Produced by New Regency Productions, the movie is directed by Hiro Murai with a screenplay by Stephen Glover. 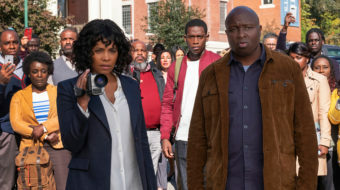 Donald Glover and Rihanna star in the two major roles of Deni and Kofi respectively, with Letitia Wright (Black Panther) and Nonso Anozie (Game of Thrones) rounding out the cast. Guava Island tells the story of the fictional island of Guava, whose main export is blue silk. The island’s wealth is held in the hands of the Red family, who own the means of production, and most of the island people are employed by them. Many of the islanders live between modest to poor conditions, working most of the week in factories and shops. Deni is a factory worker but is also a well known musician on the island: His music and local radio show are an inspiration to many. Deni seeks to hold a large festival Saturday night on the island, but is threatened by the head of the Red family, Red Cargo (played by Nonso), not to have it, as those attending will most likely call out from work the next day. Deni is faced with the choice of heeding the threat of Red Cargo, and taking Cargo’s bribe money to leave the island for good, or to continue with the festival under threat of bodily harm or death. One of the positive aspects of the movie is its use of color and music to move the story forward. The colors blue and red are heavily used throughout to symbolize a variety of components making up life on Guava. The working people, who produce the wealth of the Red family, are often clothed in bright blue fabrics, while the Red family, and all things associated with it, are in red. In the very beginning of the movie, an animated short helps to tell the origin story of the island: Blue is known to represent love, while red represents war and rage. Looking deeper into the coloring, one could say that blue is often associated with water, which is connected to life, thus driving home the idea that the working people of Guava are what gives Guava, and the world, life. Red, often associated with fire, could be seen as showing how the Red family, the exploiters, serve not as nurturers to progress and growth, but destroyers of it. Music, of course, plays a pivotal role in the plot. A variety of musical breaks in the film help to drive home certain messaging. Gambino’s popular song “This is America” is repurposed to speak to the exploitative system he and his co-workers find themselves in under the Red family. While one coworker explains how he plans to make enough money to leave the island and go to America, where he believes success in entrepreneurship can be found, Deni counters this idea. 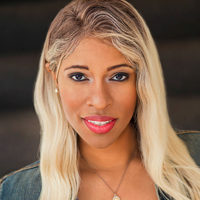 Through “This is America,” Deni expresses that everywhere is “America,” Guava included, because America, too, is a place where many work in the chase for riches, only to line the pockets of the wealthy few. Moments of song emphasizing emotions and personal connections are interwoven throughout the film. 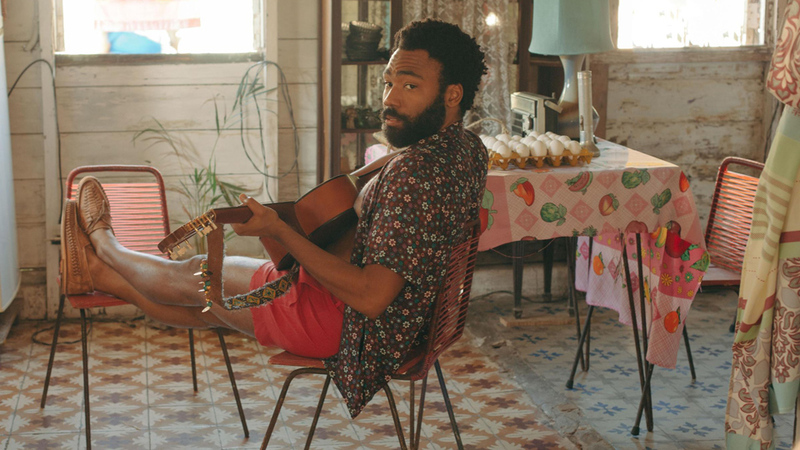 Gambino’s previous songs “Summertime Magic” and “Feels Like Summer” also make appearances, along with new pieces, such as “Die With You.” Some viewers may dismiss Guava Island as one long Childish Gambino visual album, but the music only serves as an exclamation mark on the messaging that is at the heart of the film. Donald Glover gives a strong performance as the rebellious musician with dreams of something greater for his people. He portrays Deni with playful charm and simultaneous maturity that gives the character nuance. Rihanna, as his romantic partner Kofi, is a pivotal part of the film, although she doesn’t have as much dialogue and screen time as Glover. The focus of the film may be on Deni’s decisions and plight, but Kofi is both the literal and figurative storyteller of his legacy, and the legacy of the island, as the woman in love with a man who may have to make the ultimate sacrifice in the face of oppression. It seems fitting, and no coincidence, that Guava Island was filmed in Cuba, a country with a history of people rising up against oppressive regimes. In the late 1950s Cuban revolutionary Fidel Castro led the July 26th Movement in overthrowing U.S. puppet, dictator Fulgencio Batista. Since then, Cuba has remained a self-proclaimed socialist land; its current Constitution states it is a country guided by “the ideas of José Martí and the political and social ideas of Marx, Engels and Lenin.” What better location to tell a story of islanders uniting to defy exploitation and putting capitalist greed on trial, than a place in which it actually happened! Guava Island is filled with passion, color, music, and a relevant message. Those familiar with Gambino’s music will enjoy the remixes and adaptation of his sound interwoven in the story, but those not familiar with his work won’t feel alienated, as the tale is a universal one. The movie does well in displaying the hope of a man in the pride of his people, and the spark of revolution that art with purpose can ignite. Guava Island is currently streaming on Amazon Prime. An official clip from the movie can be viewed here.